The world is much more than you can see! There is an invisible multitude of microorganisms which are our life support. A crowd on which we depend. Discovering, recognizing and exploring the importance of microorganisms is a long road that is not yet appreciate by all. The aim of creating the Day of the Microorganism is to raise awareness among young people and society in general of the role of microorganisms as life supporting systems and biotools. The Portuguese Society of Microbiology, Ordem dos Biólogos, UNESCO Portuguese Commission and Ciência Viva Agency organised an exciting and very diversified exhibition and invited citizens from all ages to explore microorganisms and help them realise that there’s an invisible world out there formed by a multitude of microscopic organisms from which we are highly dependent. The 17th of September was chosen to celebrate the day when the Dutch scientist Anton van Leeuwenhoek, in 1683, has sent a letter to the Royal Society of London making him the first person to observe and describe single-celled organisms. These were originally referred to as animalcules (now, microorganisms), thereby launching the basis for Microbiology, one of the most important branches of Life Sciences. 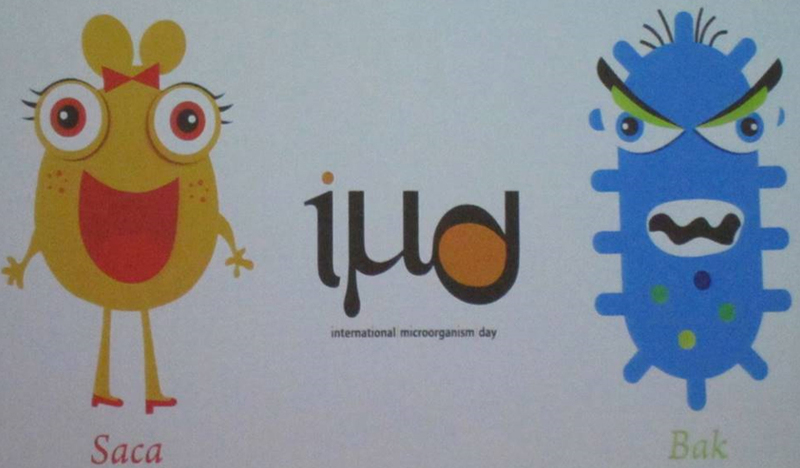 The International Microorganism Day was celebrated, for the first time, on September the 17th 2017, at Pavilhão do Conhecimento, in Lisbon. Pavilhão do Conhecimento is the home of a Contemporary Science Centre since 1999, with interactive exhibits, experiments, conferences and workshops constituting the perfect venue for disseminating science and share experiments with the public. A logo was designed to launch this special date. Two mascots were designed and build specifically for this event, representing two major groups of microorganisms: the yeasts and the bacteria. The mascots interacted with the visitors throughout the exhibition and were highly appreciated by both children and adults. Over 850 people have visited the exhibition raising to 1000 the number of persons involved in the event. The stands were divided into 3 main categories: Learn, Apply and Explore (see program attached). Visitors could see microorganisms, touch, smell and taste products thereof, and listen and read about the importance of microorganisms in all aspects of our daily life: Health, Environment, Food, Biotechnology, Research, Education, etc. The event was disseminated in the media, including a radio interview with Prof. Isabel Sá-Correia, the President of the Portuguese Microbiological Society (SPM), (available as pod-cast in the site of the Public TV channel RTP; https://www.rtp.pt/play/p383/e306925/os-dias-do-futuro), blogs, sites, social networks (facebook and twitter) and newspapers. İsn’t Robert Hooke first person who draw fruiting structures (sporangiophore) of mold in Micrographia in 1665? So I think you must add his name to history of “microorganisms” and “microscope”.